This has been an especially good year for chicken picture books. Between this, Why Did the Chicken Cross the Road, and Cat and Chicken poultry appears to be in fine full force. If I were to label my favorite kind of picture book out there, I might feel myself strongly inclined towards something I call Barnyard Frivolity. These are the picture books that take place on an “ordinary” farm and involve all kinds of good-natured looniness. For example, one of my favorite books this year was the upbeat and mighty fun, Manny’s Cows: The Niagra Falls Tale by Suzy Becker. This book held a special place in my heart until my pretty little head was turned by the incredibly amusing chicken book I hold in my hands in at this time. I don’t know how effective you personally feel that a flock of chickens would be in an emergency, but when it comes to benign fowl-inspired lunacy, I think “Chickens To the Rescue” trumps them all. This is perhaps THE greatest poultry book dreamed by mankind. 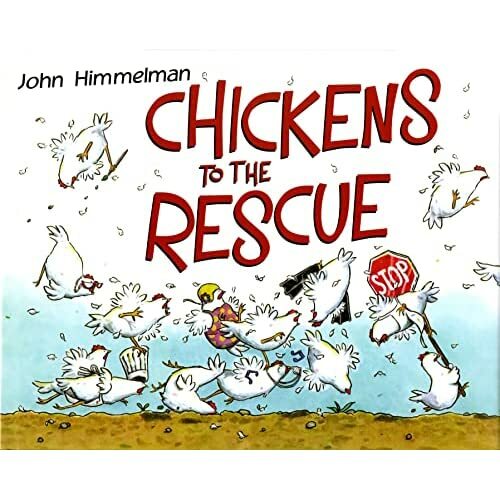 By and large, author/illustrator John Himmelman is an animal man. He’s done plenty of non-fiction titles on everything from ladybugs to frogs. As of this writing his top selling book (according to Amazon) was something called Discovering Moths: Nighttime Jewels In Your Own Backyard. What seems to set Himmelman apart from the vast non-fiction writing pack (and here I’m relying heavily on customer reviews) is his humor. By all accounts, Himmelman is a funny guy. A funny guy that has been given a chance to bring us a true labor of love. Now since Himmelman is such an animal advocate, I’m assuming that that is why his chickens look as realistic as they do. Yes, they’re wearing helmets, aprons, scuba equipment, etc. But they also look like chickens. Size-appropriate, remarkably helpful chickens. It’s obvious from the outset, by the way, that verbal humor is not Himmelman’s sole strength. He works enough visual gags and tiny amusing details into this book as to allow your average child-reader hours and hours of fun “I Spy” moments. I may have mentioned that my favorite image from this book is when the chickens rescue the sheep from a nearby woodland. Well let me tell you that there are few sights finer in this world than that of small determined chickens lugging enormous wooly sheep over their heads. Some of the birds even go so far as to lift the sheep into the air, causing one ewe to pretend to be a superhero, hooves held straight out in front. Also, in each rescue sequence there is always at least one chicken flying upside down. The variety of their postures and poses, even when removing a cow from a tree, is to be commended. I don’t want to tell you how to live your life, but I would like to give you a bit of advice on purchasing this book. If you could somehow manage to buy both, Chickens To the Rescue and the incredibly funny, Why Did the Chicken Cross the Road (featuring such artists as Mo Willems, Marla Frazee, Jerry Pinkney, and others), you would instantly be the coolest gift purchaser in the world. I am not kidding. Together, these fowl-related works of literature make up some of the funniest, enjoyable, and inventive books of this or any other year. Chickens To the Rescue is now my favorite fowl book of all time. A must-read for anyone with a sense of humor. Have you read Big Chickens by Leslie Helakoski, and illustrated by Henry Cole? That one really cracked me up, esp. their crazy outfits. Nope. Missed that one. Did it come out this year? Big chickens make me think of Chicken Boo, the greatest skit to play on that old television show "Animaniacs". I can't hear the tune Turkey in the Straw now because of that skit.